A study by Chubb Insurance shows that while on vacation, just 19% of homeowners view internal water leak damage as the most concerning threat to their home, despite the fact that water leaks are a more frequent risk than fire and theft. Homeowners are particularly vulnerable during summer travel season. According to Chubb, "the time between when a leak occurs and when it is discovered is the single greatest factor in determining the amount of damage. As a result, leaks that occur while you're away result in greater amounts of damage in terms of both cost and severity." 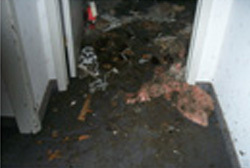 Water damage claims have been rising over the last few years as well. In the last 10 years, the frequency of pipe bursts has nearly doubled. In addition to the increase in leaks, 90% of homeowners rate themselves as "vigilant" at preventative home maintenance, yet only 22% shut off the water main before heading out of town. Add a yellow tag to your water main shut off valve in case of a water emergency. Click here to receive free tags from us! To learn more about water leak damage and protecting your home, view the following infographic, "Don't Get Water Logged" or contact a KnowledgeBroker.